On the other hand, if the person who loves you is a spouse that you want to divorce, you may feel guilty, sad, impatient, angry…. If the person who says “I love you,” is stalking you, you may be afraid, angry, anxious, curious…. Those words ending in “-ed” are passive. They indicate that someone has been acted upon, but in themselves the words carry no emotion. The person who is acted upon can have a full range of emotions about the situation. However, some of these “-ed” words have acquired so much baggage that we think of them as feelings. The person who is allergic to wasps may feel glad to have the picnic cancelled; the person who just baked two pies, assembled a prize-winning potato salad, and who was hoping for lots of acclaim as a cook and baker, will likely have different emotions. You can bet that the puppy’s feelings are different from the person who put the gate up in the first place! Take a GED or a pre-GED student attempting a newly assigned set of math word problems. He solves the first one and checks with his neighbour, only to find that she has come up with a different answer and is confident that she is right. He has been frustrated in his attempt to arrive at the right answer, but cheerfully attacks the problem again. He thinks he finds the error in his thinking, and arrives at a new answer. Pleased with his efforts, he flags his teacher. Again, he has been frustrated in his attempt to solve the problem, but he likes the advice from his teacher, takes another look at the example, and tries again. He is still frustrated when his neighbour, whose work has now been marked right by the teacher, whispers that his new answer (the third) is still wrong. This news does not deflate him, however. He sees that heroic measures are called for and digs in with a will. He changes all the big numbers in the problem to small, manageable ones. It is a strategy his teacher has taught him, and when he uses it, sometimes his intuition kicks in and shows him how to proceed. He stares at the modified problem for a few minutes, squinty-eyed, and waits hopefully. Nothing happens. No flash of inspiration. He has been frustrated once again, but, since the class has come to an end, he packs up his math to do for homework, and goes out, still hopeful . When he digs his books out again that evening, the atmosphere is different. There is no cheerful buzz of other students around him working on math. There is no teacher in the room, ready to help if asked. He feels less confident, less hopeful, now that he’s home, but he squares his shoulders and starts in again, hoping to get the homework out of the way in time to watch the game on TV. After looking at the problem for a few minutes, and going over the example, he looks up the answer in the back of the book. Turning to the problem again, he tries to work backwards from the answer to find how the problem was solved, but he cannot figure it out. At this point, he decides he needs help, so he asks his wife to take a look at the problem. It’s a little dicey, asking his wife–sometimes she’s very helpful, at other times impatient, but no matter what her response, he never likes to be dependent on her. Still, she’s his best bet right now. She takes a look at the problem, takes a look at the example and announces that she does that kind of problem a different way; she can’t do it the way his book says to do it. He feels desperate to get his homework done before the game starts, so he asks her to show him how she does it. She takes his pencil out of his hand, pulls his notebook towards herself, and settles in. He sits, bored and a little anxious, waiting. Most people would recognize that last interchange as frustration, but in reality, this student has been frustrated since he first set out to do the page of problems, in the sense that there was a barrier to reaching his goal, and he was struggling to overcome it. The steps I’ve recounted here might have taken 20 or 30 minutes in class and half an hour at home, but most people would not have seen frustration until the very end. Over that hour, we would have seen him cheerfully applying clues from his teacher, thinking as he talked math with his neighbour, being creative as he re-jigged the problem to court his intuition, resilient in the face of repeated failure, practical in asking for help. We would call him persistent, not frustrated. We would call him engaged. Both teacher and student are using “frustrated” to name that negative feeling that came at the end of that long hour of frustration, engagement and persistence. When we focus on the last minute of this hour, the slamming of the books, the giving up in defeat, we miss seeing the work that was done. Even more damaging, when the student remembers only the defeat, the feeling stupid, the anger at himself and at math, he has an incorrect idea of himself as a student. He sees himself as a quitter rather than as someone who persists. He sees himself as a failure instead of someone with a variety of skills, strategies and methods of attack. As teachers, we can decide to look at all the emotions that students display when something is blocking their paths to their goals. Furthermore, the feedback we give can help students to see their growing repertoire of skills, and their positive engagement in the process. Especially our students in adult literacy, GED prep, adult basic education, upgrading, call it what you will, who have experienced years of failure, need help to see themselves as acting like successful students, even when they are not learning quickly. Frustration is the garden where persistence grows. I enjoyed reading this entry—especially the exploration of frustrated and the meta-concept of frustration. The idea of feeling frustration, rather than frustrated, resonates. So, too, the passive nature of -ed. It is on the -ed, however, that I depart a bit from your perspective. Saying that I feel “loved” can be more than passive, I think. It can be an umbrella term, used between people who know each other well. There might be many attributes of feeling loved that would be overbearing to include within the flow of conversation. Finally, I’m not sure I can come up with strictly defined feeling words to describe concepts like feeling cherished, valued, appreciated, etc. And, in my line of work, there is value in the fact that -ed words are relational, by default. The degree to which clients include others in their conceptualizations is clinically relevant. Thank you for sharing for your thoughtful and compelling perspective! Thank you for your useful take on “umbrella terms” which do offer an opportunity to explore the nuances of the feeling for each individual. And then we can talk about specific things, and explore the feelings around not being in control of her life the way she used to be. I feel that we need to stop and take a break, if impossible..and look around. Hi Kate. Good thing it is a holiday because I have just gone off on a very interesting tangent following your mention of Plutniks’s Wheel of Emotion instead of planting the garden and getting dressed. Thank you. And for the ‘ed’ clue. One of the things that I was taught to use as a clue to help accurately pinpoint emotions and distinguish them from thoughts is the use of the words ‘feel that’. Anytime someone says “I feel that you are angry at me” I look for a thought, (assumption, opinion or judgement) masquerading as a more acceptable feeling. I hope your gardening today is as fruitful as your morning’s exploration. Once again you have provided a whole new way to look at something or to “feel” something in a different “big picture ” kind of way. I like the connect between persistence (a “good” thing) and frustration (a not so “good” thing), a completely emotional reaction on my part, but providing comfort and guidance. Here’s my question which i have tried to find an answer to in the past: how do you tell what counts as an emotion and what not? I have tried to find a list (such as the wheel) in the past, tried to determine by what criteria something is or is not an emotion ….does ‘bored’ count, or not, since it is passive? But ‘I feel bored’ or ‘I am bored’ makes logical sense to me and it FEELS like a feeling…and ‘boredom’ is on the feeling wheel. Similarly for example ‘I feel threatened’ is different than ‘I feel scared’: threatened has the menace component that mere scared does not.. To me the FEELING of feeling threatened is different than the FEELING of being scared, though related. I am not being a challenger here (or maybe I am; I don’t know). I just genuinely don’t know what is or is not an emotion. On the emotion wheel I was surprised to find trust, admiration, pensiveness – literally, thoughtfulness – which are attributes i more associate with thinking, or maybe thought + feeling. Hi barbara–I’m not qualified to answer your big question, but I’ll look for a link that might help. As for the term “threatened,” I would say it’s not an emotion. In the case where someone has made a threat against you, you might have many emotions in response, depending on what the threat is, who is making it, and your perception of the liklihood of the threat being carried out. For example, if someone says, “Your money or your life,” and has a gun in your side, you might feel terror. If someone says, “Do what I ask, or I’ll tell everyone that you are a queer lawyer,” you might feel surprise that anyone would think that was a threat, or you might feel contempt for the person making the threat. Wonderful observation about -ed words for feelings in general and “frustrated” in particular. 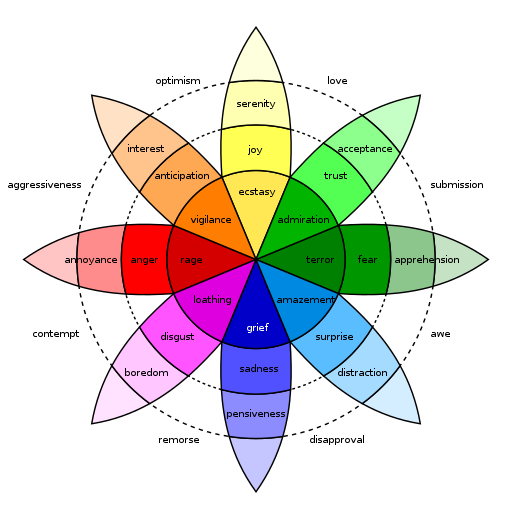 I also love the emotion color wheel (or flower) at the top. Thanks, Chip–I love that graphic too. And not a single “-ed” on it!